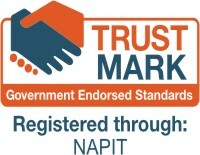 Vinyl Signs and Magnetic Signs can be supplied with the Trust Mark and NAPIT logos if you are Registered with these organisations and have their authorisation. BSI Registered Logos and SIA Approved Contractor Logos can also be used with the permission of the registered owners of the trade marks. To be able to buy signs with these logos you will need to provide your registration details and number and these must match the business or service being advertised. Logos can only be supplied once TRUSTMARK, NAPIT, BSI or SIA have confirmed the registration details and authorised use of the logos.. The Logos can be supplied in sizes to suit the requrements of the sign being supplied and the size of the space on the vehicle. TrustMark is a new, award-winning scheme supported by Government, the building industry and consumer groups to help your customer find reliable and trustworthy tradespeople to make improvements and repairs inside and outside their homes. Display TRUSTMARK and NAPIT Logos on your Vehicle in either permanent Vinyl or removeable Magnetic Signs.